I was really excited to read this book. I'd heard such great things about it and I couldn't wait to get my hands on it. So when I was offered the book for review, I jumped on it. And I am so happy I did! This is my first book by this author, though I own others! I wasn't sure what to expect. Honestly, I didn't even know the premise of the book. Just that I wanted to read it because all my friends said it was great! And so I jumped in, blind leap of faith, and was pleasantly surprised by what I found. A book with no pretentiousness, no story based only on the attraction of the two main teen characters, a book that touched on deep emotional ties dealing with family, a book with true depth. 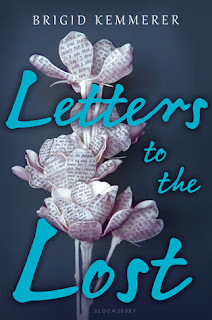 Without giving too much away I will say Juliet Young has lost her mother and has found a way to keep her connection with her alive by writing her letters. Until one day, someone writes back to her. Thus starts her relationship with The Dark, who she can relate to on so many levels. The Dark, aka Declan Murphy, also finds it cathartic to write to Juliet. He becomes a different person on paper than he shows in public. Or at least a different person than he is perceived to be in public. And this is what keeps him a mystery to Juliet, even though she feels he's connected to someone else she has slowly been getting to know. What I loved most about this book was how honest and raw both Juliet and Declan were on paper. It speaks to how we are able to sometimes express ourselves so well when we are hidden behind something (paper, a screen, a text message). I love how raw the exchanges between the characters are in these letters. And yet, you see a different side to each of them when they are face to face. This book has sweet moments, and funny moments, and then heart wrenchingly sad moments. The baggage that each character carries with them tugs at your heartstrings. I was especially drawn to Declan. My heart hurt for him throughout so much of this book because he was just so misunderstood. I wanted to envelope him in a hug more times than not to tell him everything was going to be ok. That it was ok to be this teenage boy who was full of emotion and anger; that it was ok to let it all out. By far, my favorite side character in this book is Rev. He's a bit mysterious, which lends to his intrigue. Plus he is one of the truest friends I have ever seen in a YA novel such as this. I love how he is not afraid to express his love for Declan. No holds barred they are like brothers and Rev would have no problem putting himself in the line of fire for Declan if it ever came to that. I was truly excited when I heard he will be getting his own story. Overall the story is sweet and a bit heart wrenching with definite humor thrown throughout. The characters are well thought out and relatable. The writing flows well and the pacing is perfect. Anyone looking for a contemporary YA without all the sticky romantic mess you're used to seeing should give this one a try. That's not to say there isn't some romance, oh, you'll see that, but it's in no way central to the story. Which I think is the highlight to what makes this book so phenomenal.